Create a special outfit for a Halloween party, going trick-or-treating, or any other event where you need to look like a character from centuries or millennia past with Historical Costumes! There are plenty of styles for kids and adults to choose from, like cavemen, colonial outfits, Egyptians, Romans, and lots more, as well as accessories! Suit up and get ready to remember the past in some serious style with our extensive collection of historical costumes! Whether you’re looking to pay homage to the ancient Romans with a toga or celebrate the life of a beloved American president, we’ve got the goods for an exciting trip back in time. Sometimes the most timeless costumes are the most simple. The Deluxe Classic Male Toga costume is simple and the modern definitive of the ancient world. It comes with the tunic, belt and wrist cuffs to bring Ancient Rome right to your doorstep. Do you want to start the chant or should we? Now this dude is arguably the most well-known historical figure in the whole wide world. The Jesus Child Costume comes complete with the robe, under-robe and belt to have your child donning the simple and authentic-looking shrouds of the man himself. Just turn water into wine and get ready for a good time. The caveman represents the most basic and primitive form of humankind, but also the most resilient and resourceful. 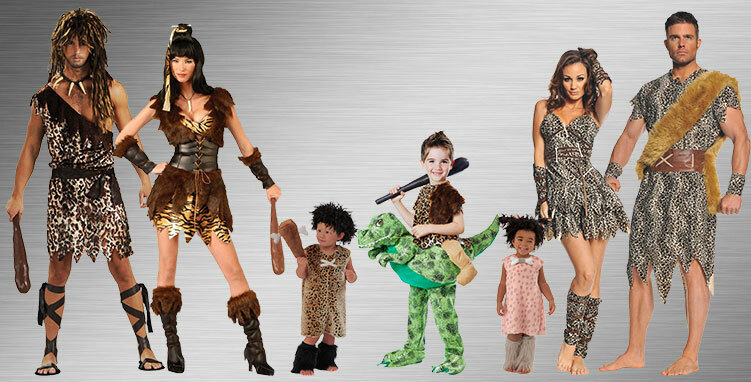 The Cave Stud Adult costume includes the tunic and belt and lets you showcase the studly strength of early man. Let out a grunt, gird your loins and hit the town. We would make a Civil War joke here, but we don't think General Lee would like it very much. But seriously, a large square in our great nation’s checkered past, the Civil War was a nasty bout pitting brothers against brothers and neighbors against neighbors. For your next Halloween party, celebrate the heroism of the soldiers with the Civil War Soldier Child costume! These Union duds come complete with the jumpsuit and belt, shoulder strap and forage cap to keep you fighting for freedom. Though often forgotten in the history books, early America was teeming with influential women who worked to form the backbone of a strong, progressive society. Betsy Ross, Martha Washington and Abigail Adams to name a few. Pay homage to those fervent females with the Colonial Girl Child costume, complete with the dress with attached apron and cap. The time of the ancient Egyptians is a highly studied time, often clouded in mystery and the supernatural. Channel the Queen of the Nile within with the Cleopatra Deluxe Child costume. These ancient coverings come with the beautiful golden dress with decorative collar and belt and the brilliant headpiece to pull it all together. A time of rebirth and ideas. A time of boldness and exploration. A time of really awesome outfits. The Renaissance period is known for people who embraced clothing for fashion’s sake, worrying not about what was comfortable but what looked magnificent while waltzing through the town square. The Renaissance Princess Women’s Dress costume comes in the gorgeous purple and gold sleeved gown with a petticoat and detailed headpiece. You’ll be stunning and sophisticated from head to toe. If you’re ready to be the belle of the ball, then look no further. Harken back to a time where lavishness and grandiosity reigned supreme. This Women’s Deluxe Victorian Vixen costume comes complete with a blue top, a royal skirt and matching hat. You’ll look like you just jumped off the pages of a Charles Dickens novel. As long as humankind has roamed this earth, we’ve found it safer, more comforting and even easier to walk through life together. From armies to explorers, minstrels to secret societies, we’ve deemed being a part of a group a more fun way to live. Does the same hold true for group costumes? You’re darn right it does. And the Historical theme presents many fun ways to be a part of the crew and show that strength really can lie in numbers. Now, everyone can pick his or her favorite! George and Martha Washington, reunited at last! Abe Lincoln and the Civil War Soldier standing side-by-side in solidarity. Maybe even a caveman and a toga just to mix things up. 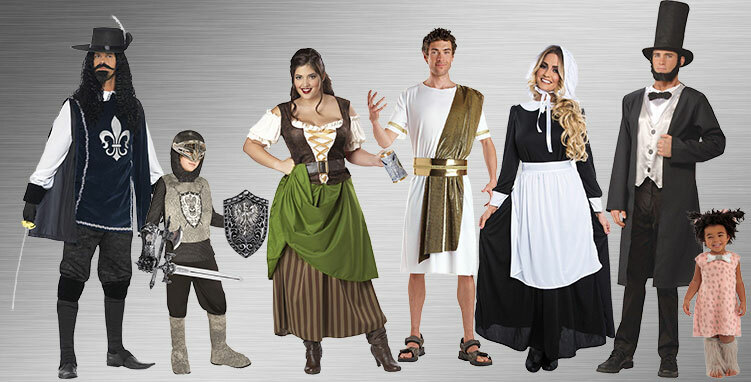 The opportunities for fun combos are positively endless here at BuyCostumes, and we know you’ll find the right antiquated costume recipe for the perfect night out. Well load my musket and call me Martha Washington. A brave and valiant Union soldier and the Great Emancipator himself together again. Talk about epic. 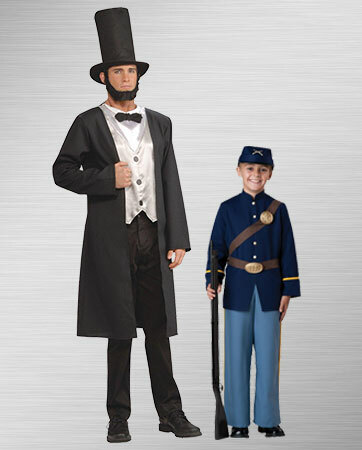 The Abraham Lincoln Adult and the Civil War Soldier Child costumes make the best combination this side of the Mason-Dixon Line. Host of the party didn’t have the decency to throw a toga party? We’ve got you covered with the perfect pair to right that awful wrong. The Male and Female Adult Toga costumes are the classy way to show that you’ve changed a little since college, but you didn’t forget how to have a good time. Pay tribute to American history and let freedom ring in the most adorable way you can. 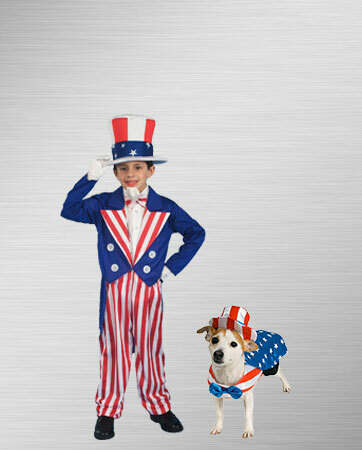 The Uncle Sam boy and dog costumes pair your favorite parts of your family in one ultra-cute costume combo. You won’t have to salute this red, white and blue, but you just might want to. Send your kids back to the '90s…the 1590s. 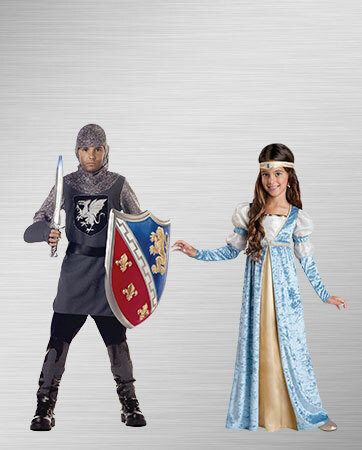 The Valiant Knight and Renaissance Maiden children costumes make a perfect pair for a Renaissance Festival, costume day at school, or a regular old costume party over at the neighbors. Sound the trumpets and usher in the good times with the fairest pair in all the land. 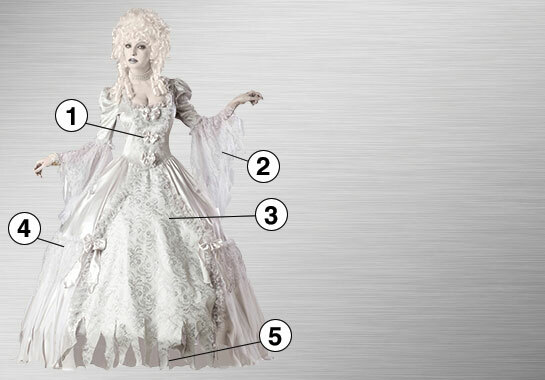 If you’re ready to make a frightening statement with your historical costume, look no further than the Ghost Lady Elite Collection Adult Costume. This Victorian-era vixen is a highly detailed and well-assembled outfit that’s sure to turn heads ... and stomachs. The bright white lace dress features a plunging V-neckline and comes complete with torn lace details on the bottom and sleeves to give it a distinct and ghastly appearance. The bows and patterns down the front give this number an unforgettably unnerving appeal. This is the ultimate costume for a freaky good time at your next monster bash. If you’re a costume-party veteran, you understand full well that the devil is in the details. And though we boast a huge array of anchor costume pieces, our collection of perfect accessories is, in our humble and objective opinion, just as impressive. 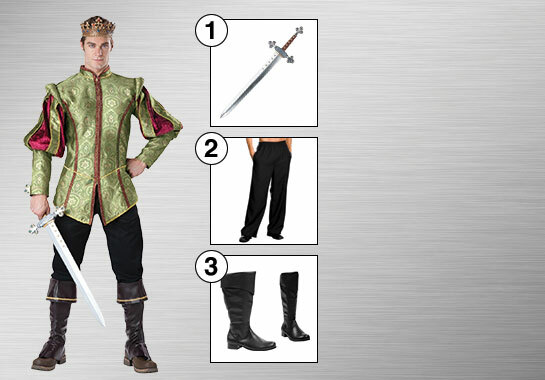 If you’re dressing up as a noble Renaissance prince, you won’t make it much past “that dude from that one movie” without the lion knight’s sword by your side. And if you forget the black pants and Bernard black adult boots, you’ll just look like a Disney character who got booted off the set by the costume designer. In short: Go big or go home. That's the BuyCostume way.